Finance Minister, Winston Jordan (right) and Chief Statistician at the Statistical Bureau, Lennox Benjamin. Finance Minister, Winston Jordan on Monday said he was yet to get a plan off the ground that would result in job-creation, but cited political stability and value-added production as major ingredients. “I am going to pin down a numerical target as soon as I could get my national plan going,” he told a news conference at the Finance Ministry on Main Street, Georgetown. Jordan said all “good-paying” jobs could be self-generated by small and medium businesses. The Private Sector Commission recently called on government to help facilitate the creation of at least 25,000 jobs. Head of the Statistical Bureau, Lennox Benjamin estimates that Guyana’s overall unemployment rate is about 11 percent. 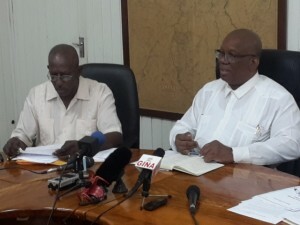 The governing A Partnership for National Unity+ Alliance For Change (APNU+AFC) coalition had promised to create jobs in the run-up to last year’s general election. Overall, he said there was need for a conducive political climate that would convince manufacturers that Guyana was ripe for investment. “Those kinds of investments down the road will have to see a significant improvement in the political climate of Guyana,” he said. The Finance Minister said another approach to create jobs would be to get into value-added production rather than merely the production of primary products such as rice, sugar, timber and gold. “Unless we do value-added, we will always be subjected to the vagaries of the market, the commodity prices and where they are today,” he said. He said that currently government was trying to reduce transportation cost between the coastland and the wealthy hinterland rather than continue with the ad hoc, dysfunctional and highly inefficient system of trails instead of proper roads and boats.